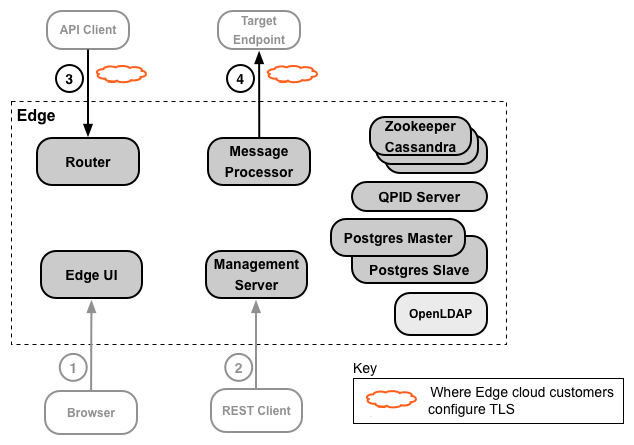 Because Edge is deployed in the cloud by Apigee, Apigee has already configured TLS access for the Edge management UI and API. That means you use the HTTPS URLs shown in the first two rows of the table below to access the management UI and API. TLS access is configured by paid customers through the use of virtual hosts. Free and trial accounts cannot configure TLS from API proxies. See Configuring TLS access to an API for the Cloud for more. You handle the TLS configuration on Edge, but you must make sure to configure TLS correctly on your backend servers as well.